Home→Blog→Uncategorized→Keeping your dog warm and safe this winter! ← Pets and Winter Hazards! Keeping your dog warm and safe this winter! Brr! Baby, it’s cold outside! Even in Las Vegas we can experience some very cold weather especially at night. Before going outside most people check the weather and dress accordingly. Dogs are unable to check the weather. Yes, they have fur coats but dogs that are outdoors for any length of time need extra protection against the cold. 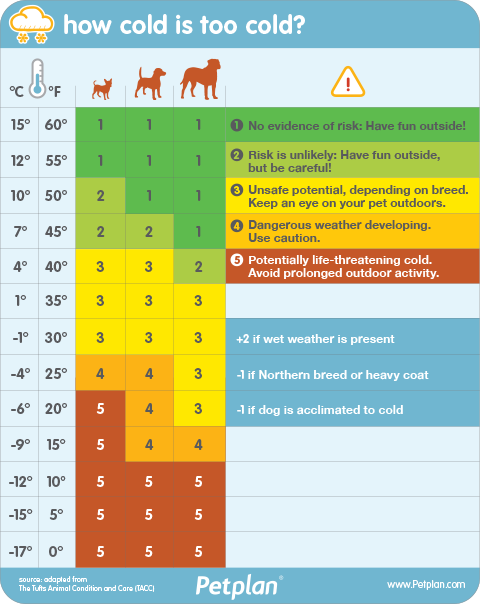 The temperature can feel worse than what the thermometer reads – check the temperature and the wind chill factor to determine what your dog needs to stay warm this winter. Dogs use up more calories in the winter trying to stay warm. Feed him a little more in the winter if he spends a lot of time outside. Caution: Indoor pets conserve energy by sleeping more in the winter. They may also exercise less when they go outside so you might need to reduce the amount of food you give them to avoid weight gain. 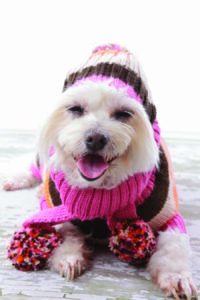 Wearing a sweater for shorthaired, senior or frail dogs will help keep them warm when they go outside. However, dogs lose most of their body heat through their paw pads, ears and through respiration so they are still vulnerable to the cold even when wearing a sweater. Cold weather can be especially difficult for young puppies, senior pets and those with certain health issues like arthritis or diabetes. Take extra precaution to protect them from getting too cold. Watch for signs that your pet is uncomfortably cold. Shivering is often the one we notice first since it is the primary way dogs use to produce heat. Others include whining, anxiety, slowing down or stopping, and looking for a warm place to burrow. Snuggle with your pet, stay warm and safe! We’ll be complaining about the heat soon enough! Note: If you have an outdoor-only pet, please consider bringing them indoors when our temperatures drop – if that is not possible make sure they have insulated shelter, warm bedding, water, and extra food. It takes more energy to stay warm when it’s cold and outdoor pets eat more during the winter.